It’ been an active April thus far & there is a severe weather threat tomorrow Tuesday April 26th, 2016. Currently the SPC has issued a Moderate Risk of Severe Weather for Tuesday. It may become a High Risk pending later model runs. 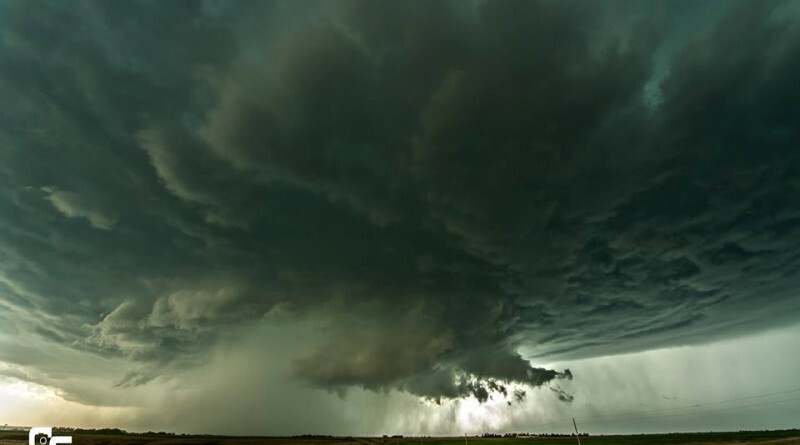 Tornadoes, some strong, are possible. There is high instability (CAPE) for storms to work with. Large hail will be a threat with any storms that develop. Tornadoes are also possible. A few of those tornadoes could be strong and long lived. Model runs have been jumping around on where the highest tornado threat will be . Right now the warm front along the Nebraska/Kansas border looks favorable. However the dryline in central KS/OK could also initiate storms. Stay tuned! Now is the time to start thinking about where to shelter. Clean out your cellar/ storm shelter. Stock them with your favorite snacks, flashlight, etc. and have sturdy shoes easily accessible. 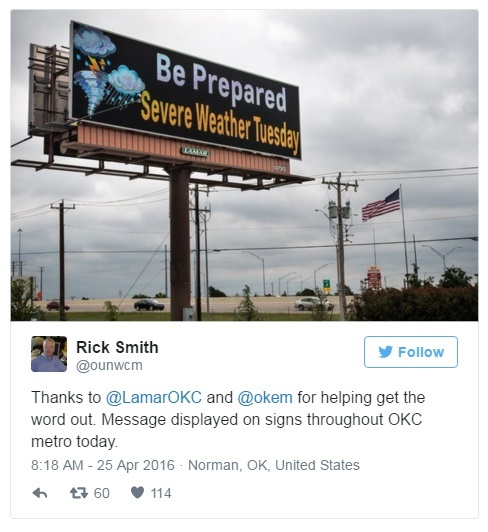 For more great updates, follow Rick Smith Norman’s NWS WFO Warning Coordination Meteorologist for info on tomorrow’s event in the Oklahoma City area. Reminder! Don’t rely on Social Media for active tornado warnings! Stay tuned to NWS NOAA Weather Radio and TV/ radio stations. [Unfortunately social media posts often get retweeted and aren’t shown live for all people due to algorithms]. 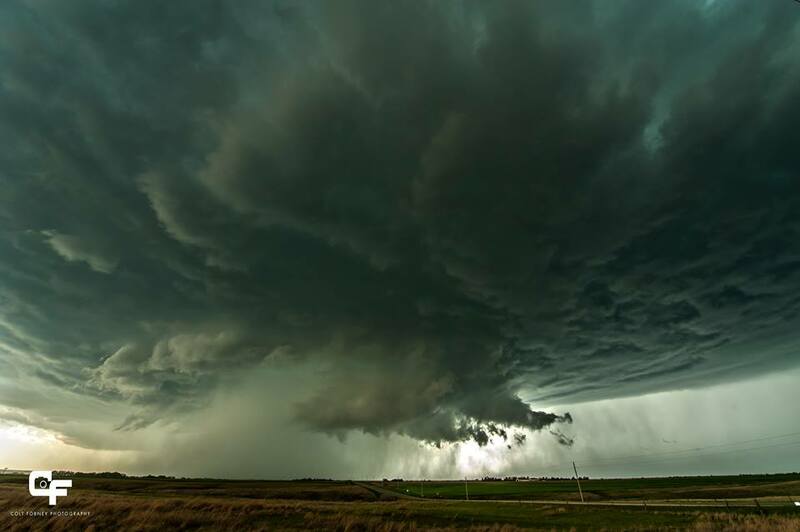 Yesterday we encountered a tornado warned supercell thunderstorm near Ellsworth, KS. Right before this produced a “likely” rain-wrapped tornado. This occlusion had tornadic rotation at this time and completely wrapped in rain shortly after this shot. We never got a confirmed visual, though we saw a cone at one point. 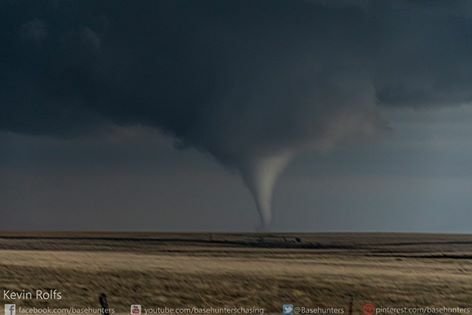 April 15th gave us beautiful tornadoes out in the open fields in the Oklahoma Panhandles. Unfortunately tomorrow’s tornado threat will likely impact larger metro areas: including Oklahoma City, Oklahoma, Moore, Oklahoma, Norman, Oklahoma, Wichita, Kansas Salina, Kansas Tulsa, Oklahoma Dallas Forth Worth, Texas Kansas City, Missouri, Saint Joseph, Missouri, Austin, Texas. One last thing, keep an eye out for chaser convergence (if you happen to be a storm chaser) and traffic problems tomorrow. During the Moore, OK tornado and El Reno, Oklahoma tornado in 2013-we learned our lesson the hard way about traffic jams in metro areas. When violent tornadoes are approaching towns- people can panic while driving when they are watching their towns get ripped apart. Word of caution: don’t chase in the metros! (if you do decide to, make sure the tornado is moving away from you). Also, safety hazard: drivers on the interstate/ HWYs who park under overpasses to shelter their cars from hail. Tomorrow could have incredibly large hail stones with the strongest updrafts. Watch out for other motorists on the roads. Stay safe! & keep tuned to NWS.